If you want to utilize any indoor positioning features in your project, adding your venues to the Proximi.io platform is required. 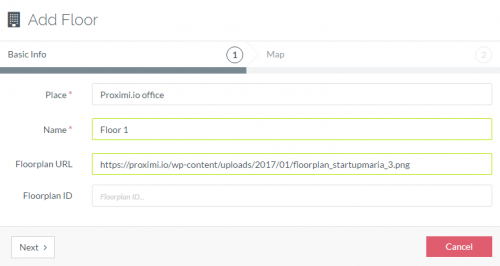 In Proximi.io system venues are called Places, and can be broken down to Floors and Departments. 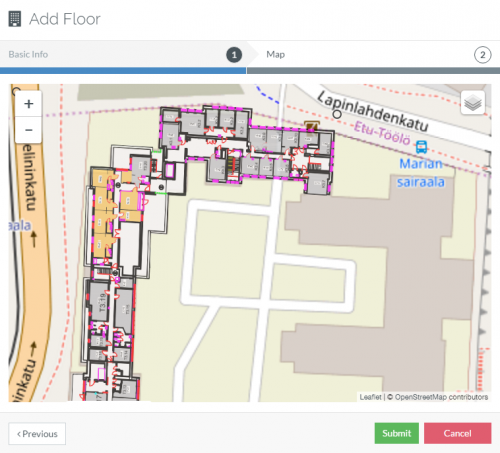 To be specific, with BLE beacons, IndoorAtlas and custom inputs Places are required. If you only want to utilize native positioning (GPS/WiFi/cellular), places are not necessary, but recommended. Adding places, floors and departments also improve the analytics quality. Adding a new place is really simple. Go to “Places” in the left-hand menu, and click “Manage Places”. 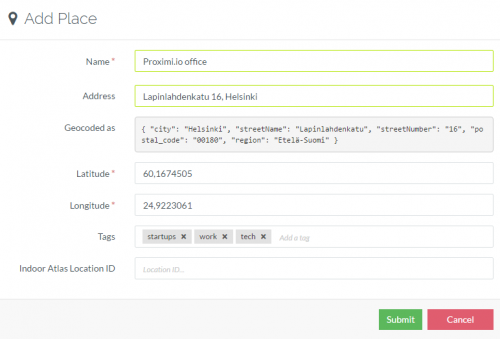 Once you enter the name and address of the place, the latitude and longitude values will generate automatically. Make sure to enter the city name with the street address. If the latitude and longitude values did not auto populate then use this link to get those values. Tags and IndoorAtlas Location ID are optional. You can obviously use this section for editing and deleting places. Next, move on to “Manage Floors”. Select the Place that the Floor belongs to, and give it a name. Linking a floorplan is not required, but will make controlling your setup, and analyzing your analytics much easier. A Floorplan ID is only required, if you use IndoorAtlas. Similarly, you use this section for editing and deleting floors as well. Click next to position you floorplan correctly on top of the map view. You can move, stretch and rotate it as needed. Lastly, go to “Manage Departments”. You need to select the place and the floor to which you are going add the department and then enter the name of the department. Tags are optional. In addition to analytics, departments are used for an important purpose: to define which position data sources are in the same room. For example beacons in the same department will be used for trilateration calculation (more on this in the next chapter).